Garage: "Garage: 2 Car Detached, Parking Pad, RV Parking; Parking Space(s): 2"
Lot Size: 9234sq. ft. 79ft x 117ft "Rectangular"
This 1565sq.ft. 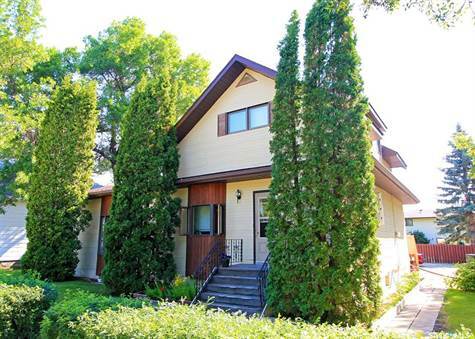 home on two levels is located only close to down town Yorkton and close to schools. There are 3 bedrooms as well 2 full baths. It is situated on a corner lot with back deck, garden area, trees, shrubs....Perfect for pets and children. Men will appreciate and large 32X24 Double detached garage/workshop, along with R/V parking/storage. Flooring and paint were done throughout the main floor in approx 2013, along with shingles being replaced. Spacious foyer leading to renovated 4 piece bathroom. The kitchen has an abundance of natural light with south facing window, offering adequate cabinet & counter space, open to spacious dining room and sunken living room with wood stove to keep you toasty warm on the long winter nights. Large master bedroom completes this space. Ready for a growing family! Book your private viewing today.